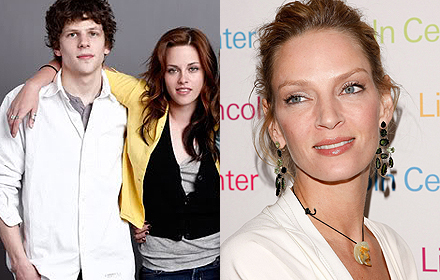 Uma Thurman is in negotiations to join Jesse Eisenberg and Kristen Stewart in American Ultra, an action comedy being directed by Nima Nourizadeh. Likely Story's Anthony Bregman (Enough Said, Can a Song Save Your Life?) is producing with David Alpert and Britton Rizzio of Circle of Confusion, the company behind The Walking Dead. Max Landis, who wrote the hit sci-fi found-footage movie Chronicle, penned the script for Ultra, which tells of an unmotivated stoner named Mike (Eisenberg) who lives with his girlfriend (Stewart) in a small, sleepy town. One night, their lives take an unexpected turn when Mike's past comes back to haunt him, and he becomes the target of a government operation set to wipe him out. Thurman will play a government worker who spearheaded a secret program to create sleeper warriors, and now that someone wants to kill her creation, she will fight back like a momma bear protecting her cub. The movie is heading toward an April 14 start, with Kevin Scott Frakes of Palmstar Media Capital and Raj Brinder Singh of Merced Media Partners executive producing. Thurman next stars in Lars von Trier's Nymphomaniac, which premiered at the Berlin Film Festival and will be released by Magnolia on March 21.